Director/Screenplay – Hatem Khraiche Ruiz-Zorrilla, Producers – Cristian Conti & Miguel Menendez de Zubillaga, Photography – Pau Esteve Birba, Music – Federico Jusid, Visual Effects Supervisors – Juanma Nogales & Ana Rubio, Visual Effects – Twin Pines, Special Effects – Mariano Garcia Marty & Jon Serrano, Production Design – Inigo Navarro. Production Company – Mono Films/Orbita 9 Films AIE/Movistar +/Dynamo/RTVE/Crea SGR/Instituto de la Cinematografica y de las Artes Audiovisuels/Insituto de Credito Oficial. Helena is the sole person aboard the Orbit 9 space mission to the planet Celeste. She was brought on board as an infant and has spent the entire nineteen years of her life on the ship. Due to an error, the ship’s oxygen supplies were depleted and her parents sacrificed themselves so she could continue on alone. She is now visited by another ship containing the engineer Alex. Having never seen another human being other than her parents before, she persuades him to spend the night with her but he then has to go. However, unknown to her, the entire Orbit 9 mission is one of a series of simulations buried underground on Earth that have been set up to test reactions for a proposed space mission and Alex is the maintenance engineer. Affected by his time with Helena, Alex returns, breaks the truth of her situation to her and then sneaks her out. The two spend their time together, she discovering the outside world for the first time. However, when her absence is realised, this makes the two of them into fugitives. Orbiter 9 is a feature-length directorial debut for Hatem Khraiche Ruiz-Zorrilla (who usually only goes by his first two names). Prior to this, Hatem Khraiche had made six short films – one of these, The Hidden Face (2011), has gained sufficient renown that it has been remade twice – as well as co-written the zombie film The Returned (2013). The film’s Spanish title Orbita 9 directly translates as Orbit 9, which parses rather clunkily in English and so the film was renamed for Orbiter 9 release to Netflix. Orbiter 9 starts out as a standard space exploration film. We are introduced to Clara Lago and the loneliness and tedium of her onboard journey before the visit of engineer Alex Gonzalez come to affect repairs (the first human being that she has ever met other than her parents) where she pleads with him to stay the night, followed by his departure. This starts things off intriguingly but the spin the film then places onto this is to follow Alex on his journey out from her ship. We are puzzled as this is not into his own spaceship but along a series of concrete corridors – I was prepared to go with this as I had seen low-budget films before that use regular industrial plants to represent spaceship interiors – but then he climbs up and out of a bunker into a standard terrestrial forest. This spins everything we have seen during the first twenty minutes into an intriguingly different territory. We have had occasional works before that reveal that what people believe to be space missions are in fact elaborate simulations – the tv mini-series Ascension (2014) or the Doctor Who episode Invasion of the Dinosaurs (1974). Orbiter 9 is the first of these to build its story as a Conceptual Breakthrough work – one where the protagonist comes to the understanding that their conception of the world is not what they initially believed it to be. Thereafter, the film follows Clara Lago’s adjustment to the outside world. The downside of Orbiter 9 is that Hatem Khraiche fires off his most interesting twist fairly early in the show. After doing so, the rest of the film feels like an anti-climax lacking in the same kind of dramatic interest. There is the romance but this hardly does anything to spark the film; there is Clara Lago’s ongoing amazement with the outside world but we are never privy to her wonderment. Seeming to lack anything else to drive the film, Hatem Khraiche has the last third of it taken up by the project head Andres Parra fiercely hunting the two of them with a detachment of armed men, whereupon ‘Orbiter 9 slips into disappointingly standard cliches of lovers on the run against a harsh and authoritarian system. 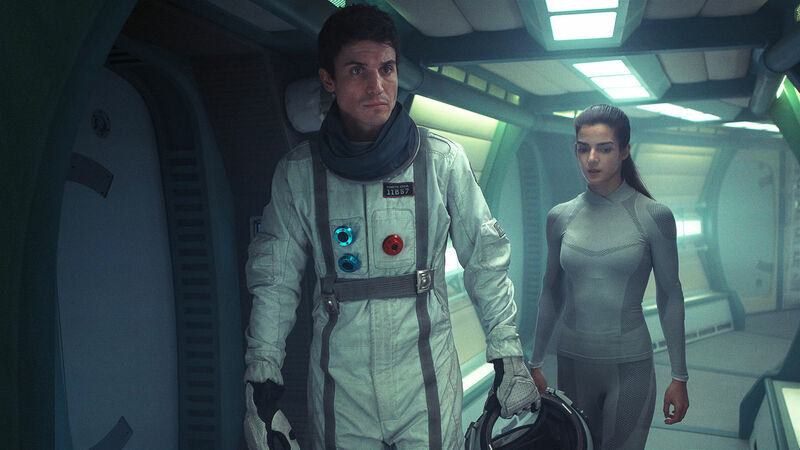 The end the film feels annoying in its happy dramatic wrap-up [PLOT SPOILERS] where Clara Lago and Alex Gonzalez decide their future is to be placed back into the spaceship simulation together. (Would two people really happily sign off on spending the rest of their lives locked up in a space about the size of an average house, never being allowed to go into the outside world again?). This is a scenario that also requires Alex Parra, who not long before was hunting and shooting at the duo, to suddenly improbably turn around and become a benevolent fatherly figure concerned about their well-being once again.